It's safe to say I'm a little partial to this session! My little sister is due with her second little blessing in just two short weeks! I may or may not already know what they will be naming her but I will leave that for them to share but I do know we are all waiting to see if she will have beautiful copper hair like her spunky big sister! 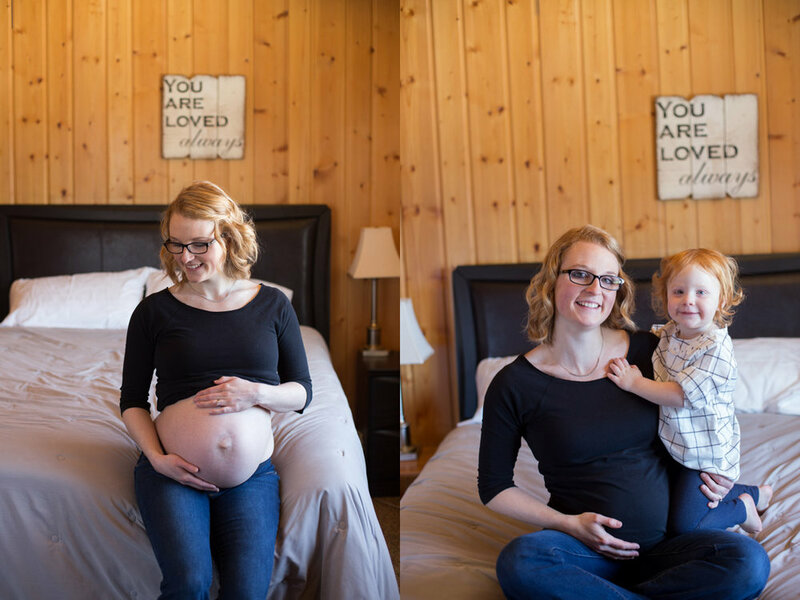 We literally got 5 quick photos before our Easter Dinner last week but I wasn't satisfied only giving her five maternity photos so I went out to their home the next weekend and we did a lifestyle session, similar to ones we took when they were pregnant with Brooklyn. Scroll to the bottom to see a flashback from that session. It wasn't super warm the day we did the lifestyle session but as I was driving out to their house all the trees looked so pretty from the previous night's snow so before I left I made Allie come outside with me to get some outdoor maternity portraits. I can't wait to help them display these beautiful photos in their home. And a little flashback two years when Allie was pregnant with Brooklyn!